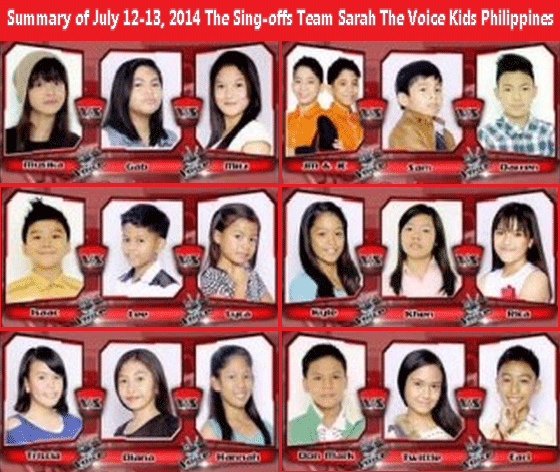 Here are the Results of July 12-13, 2014 The Sing-offs for The Voice Kids Philippines. Singing competitions will always be a part and parcel of the Filipino culture. And this is The Voice Kids Philippines that depicts how talented the Filipinos are no matter what ages. The Filipino kids are the protagonists this time showcasing their talents from blind audition to convince the judges to include them in their circles and proving themselves worthy to remain all throughout the competition. And this is more than just competition because the kids will be trained well to become a better professional someday. Coach Sarah picked Gab as the winner in the three-way battle. Coach Sarah picked Darren as the winner in the three-way battle. Coach Sarah picked Diana as the winner in the three-way battle. Coach Sarah picked Lyca as the winner in the three-way battle. Coach Sarah picked Kyle as the winner in the three-way battle. Coach Sarah picked Earl as the winner in the three-way battle. Bookmarked and reload this page from time to time to see updates about the Results of July 12-13, 2014 The Sing-offs for The Voice Kids Philippines.